While rival brand Nissan used the stage at the New York Auto Show to show off its newest GT-R performance car, Honda used the opportunity to introduce its Civic Hatchback Prototype to the North American market. The hatchback is the third variant of the tenth-generation Civic to make its debut following both the sedan and coupe models. The hatchback distinguishes itself due to it being 5.11 inches longer, 1.8 inches wider, and 0.78 inches lower than either of the aforementioned Civics. In addition, Honda will be releasing two additional Civic models later this year with the performance–oriented Civic Type R and Civic Si. It should be noted, the hatchback version that Honda brought to New York is only a prototype of the hatchback that will go on sale in the US later this year. 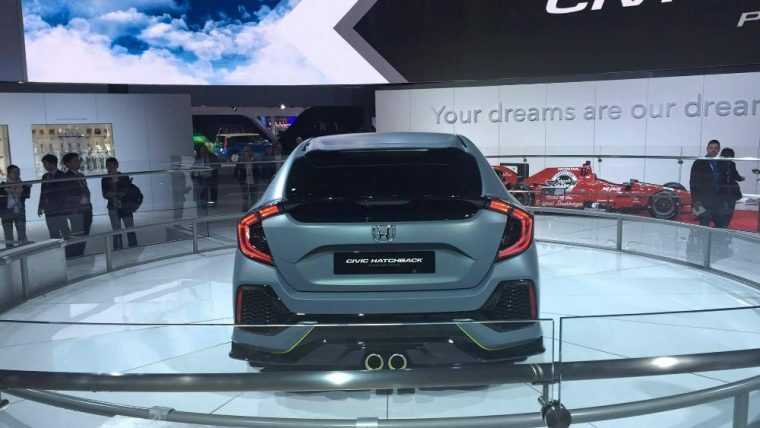 It’s likely those gigantic wheels on the prototype won’t appear on the production model, but the unique C-shaped back lights, center mounted exhaust, and aggressive front fascia all work together to give this hatchback its own distinctive look and personality. Under the hood, the new Civic Hatchback will be powered by a 2.0-liter turbocharged four-cylinder engine rated at 174 horsepower and 162 lb-ft or torque. The only available transmission for the Civic Hatchback will be a six-speed manual. In order to help promote the Civic to the younger generation, Honda brought musical artists Demi Lovato and Nick Jonas to New York for the unveiling of the Civic. Lovato and Jonas will both be featured on the upcoming Honda concert tour. However, Honda was not the only automaker to bring a celebrity endorser to New York, as Lincoln somehow convinced actor Matthew McConaughey to attend its presentation of the Lincoln Navigator Concept. The United Kingdom Honda plant in Swindon will be responsible for manufacturing the Civic Hatchback, which will come to US dealerships later this year as a 2017 model.